If a child doesn’t know how to behave, we… teach? …punish? It’s happened so often that it’s almost a cliche. Students – whose entire purpose is to learn – are punished for not knowing how to behave, rather than being taught appropriate behavior. Fortunately, attitudes toward misbehavior in the educational setting are changing. There are more than 131,000 schools (public and private) in the US, and each of them is unique in terms of school culture and climate. In each of these schools, there are students who struggle with appropriate behavior. Teaching positive and appropriate behavior, instead of punishing misbehavior, is the goal of Positive Behavior Interventions and Supports, or PBIS. But what is PBIS? In 1997, an amendment of the Individuals with Disabilities Education Act (IDEA) included the language, “Positive Behavior Interventions and Supports,” which described methods used to identify and support desired behaviors in the school setting. The educational research community has been developing and studying Positive Behavior Interventions and Supports (PBIS) ever since. PBIS seeks to reduce or eliminate poor behavior schoolwide through the encouragement of positive behaviors. The goal of PBIS is to create a positive school climate, in which students learn and grow. However, school climate can vary widely from school to school. A number of factors affect school climate, including school location, neighborhood culture, instructional methods, student diversity, and school administration. Changing school climate may seem like a daunting task. Employing the PBIS framework can make the task more manageable. The key to an effective PBIS implementation is an “all-in” mentality among teachers and administrators in a school. For PBIS to produce positive change in a school’s climate, it needs to be employed schoolwide and with consistency. School climate has bearing on attendance rates, academic achievement, and graduation rates. Regardless of socioeconomic status, students in a positive school climate are more likely to have higher test scores and greater academic success. In addition, positive school climate helps students to develop the social and emotional skills they will need to become productive members of society. It is tempting to label PBIS as simply a behavioral program. This would imply that it is a packaged curriculum designed for use in schools without alteration. However, PBIS is a complete change in how schools employ interventions and discipline. 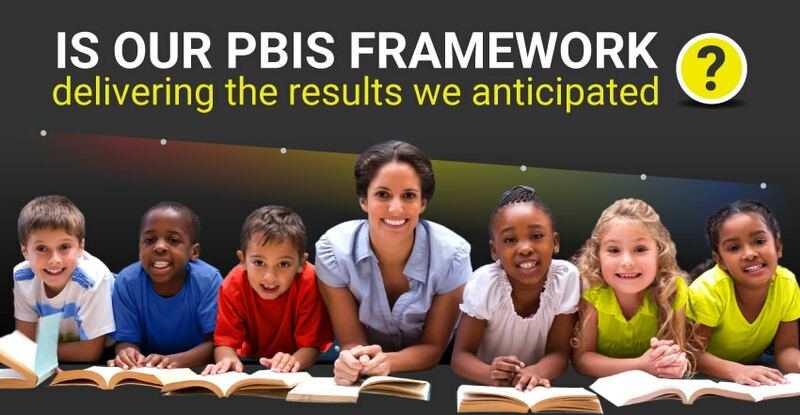 It is more accurate to call PBIS a framework focused on prevention and instruction. PBIS represents a radical change in thinking about behavior and discipline. Instead of allowing poor behavior to escalate into disciplinary measures, the focus is on teaching and promoting positive behaviors. By building on these positive behaviors, escalations into discipline are reduced. But how does a school implement a PBIS framework? PBIS uses a three-tier approach. Each of these three tiers has applications to a specific subset of students. The bulk of PBIS supports fall within Tier 1. Schools begin at Tier 1 by creating a behavior matrix outlining the positive behaviors that they wish to establish schoolwide. Depending on the school, positive behaviors might include simple actions such as walking calmly in line, throwing away trash in the cafeteria, or keeping a neat and tidy locker. As the school staff and students focus on these behavioral goals, negative behaviors begin to lessen. And because teachers are spending less time in disciplining students, instructional time increases. Approximately 80% of students never need to move beyond Tier 1 in interventions and support. For that subset of students (roughly 15%) who struggle with the Tier 1 interventions and supports, Tier 2 addresses at-risk behavior. The specialized interventions and supports at the Tier 2 level help to prevent the worsening of problem behaviors. These efforts focus on specific groups of students and the underlying issues that may be causing the behavior. Disruptive students may be dealing with social, emotional, or academic issues that result in poor behavior in the classroom. 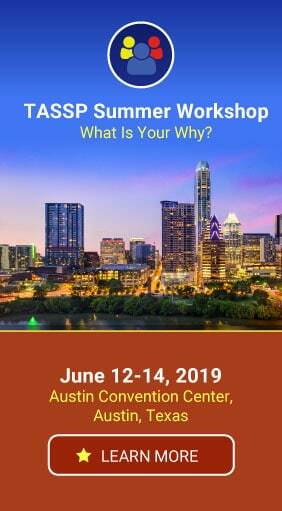 Tier 2 interventions parse out the hidden causes behind negative behavior and provide support in changing those behaviors. Students who do not respond to the interventions and support in Tier 2 receive further individualized supports in Tier 3. These interventions target students who exhibit high-risk behavior. Such interventions might take the form of an individual plan created to address specific academic or behavioral concerns. The individualized plan for each student at this level may include efforts by special education teachers or school psychologists. 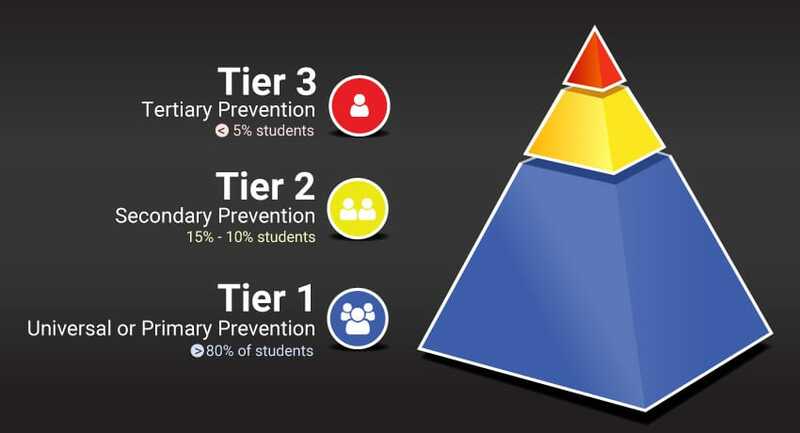 Typically, less than 5% of students require Tier 3 interventions. A successful PBIS framework relies on a commitment from the entire staff, from administration to educators to support staff. It is most effective when adopted schoolwide. Each school must identify the behavior expectations they want to develop among their students. Ideally, this is a short list of three to five behaviors. As the school identifies these core values, it also decides how those values might look in a variety of settings. For example, showing respect might mean that a student raises his hand in the classroom, follows rules on the playground, and uses table manners in the cafeteria. The next step in the establishment and identification of these values is instruction. This is accomplished by posting setting-specific actions that align with the behavior expectations as well as intentional instruction in behavior that reflects these values. When students exhibit the desired behaviors, teachers offer recognition of these actions by awarding points. Students can redeem their accumulated points for rewards and/or privileges. As the school moves through the instructional year, they consistently assess the effectiveness of their PBIS framework. 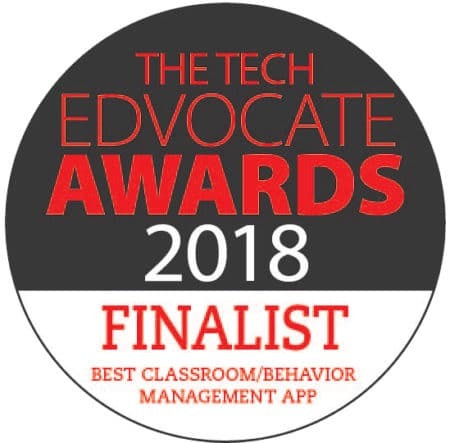 This can include analysis of data such as office discipline referrals, teacher commitment to the program, attendance, and academic achievement. When used schoolwide, PBIS changes the focus of discipline from punitive measures to positive interactions between students and staff. The positive interactions transfer into stronger relationships between the student and teacher and thus a better learning environment for all students. Adoption of a PBIS framework has the potential to create radical change in the climate of a struggling school. For educators who are seeking to reach and teach every student in their charge, PBIS makes it possible. That’s not to say that transitioning into a PBIS framework is simple. Introducing PBIS into a school can mean a certain amount of change for everyone involved. Educators and administrators alike may expect it to be short-lived, like some behavioral programs they have experienced. Students may be wary of this change in focus on behavior. Parents might feel as if the school is turning soft on discipline. It’s important at the outset to understand what PBIS is not. Additional reading: 10 Myths in Implementing and Maintaining a PBIS Program. Adopting PBIS is a commitment to change. It requires a shift in thinking from all involved, and a willingness to commit to ongoing PBIS training based on the specific needs of each school community. It’s likely that a school already has initiatives in place that work. PBIS pulls those initiatives together, together with the identified behavior expectations, into a universal model of behavior for the entire school. Because staff within the school develops and defines the framework, teacher buy-in is more likely. It is this buy-in that will power the framework throughout the school year. Implementation of PBIS is only part of the equation. The other part is assessment. As a school implements PBIS in all areas, a wealth of data begins to accumulate. As is the case with most sets of data, there are dozens of ways to parse out the information provided. All assessment should be stacked up against a central question: is our PBIS framework delivering the results we anticipated? Most schools using a PBIS framework enter into it with the twin goals of improving school climate and reducing office discipline referrals. Evaluating the data allows a school to see what is working and what still needs improvement. 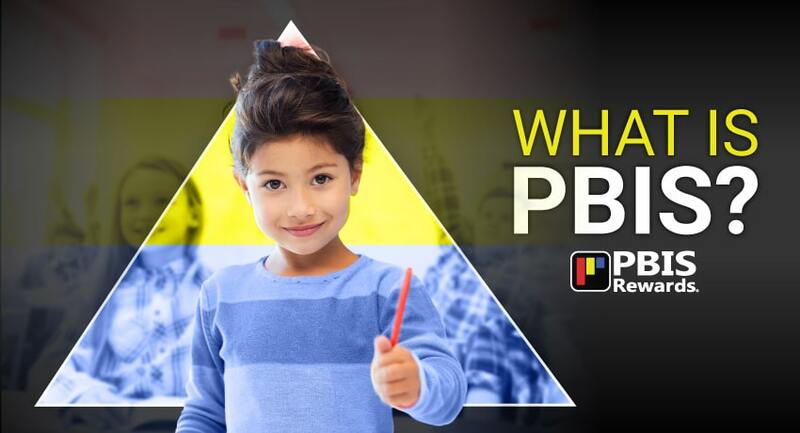 Because PBIS is a significant commitment of time, training, and resources, positive, permanent change will continue to take place over the course of several consecutive school years. Many students are not coming to school with the social and emotional skills they need to be successful in the classroom. Punitive measures and zero-tolerance policies are not effective in the long-term. But in an environment in which positive behaviors are taught and recognized, students can develop into solid citizens, both at school and in the community. PBIS decreases office discipline referrals, increases instructional time, and improves student achievement. It encourages the development of positive teacher-student relationships. In addition, it provides students with the foundational skills they will need for success in life. Implementing a PBIS framework can have a significant effect on overall school climate. Students are more productive, teachers are happier, and the larger community benefits. Perhaps most importantly, PBIS allows educators to do more of what they love – teach! PBIS Rewards is an affordable schoolwide PBIS management system that assists schools in their Positive Behavioral Interventions and Support (PBIS) program. We’d love to show you how easy it is to simplify your PBIS program management. You can request more information or experience a PBIS Rewards demo.